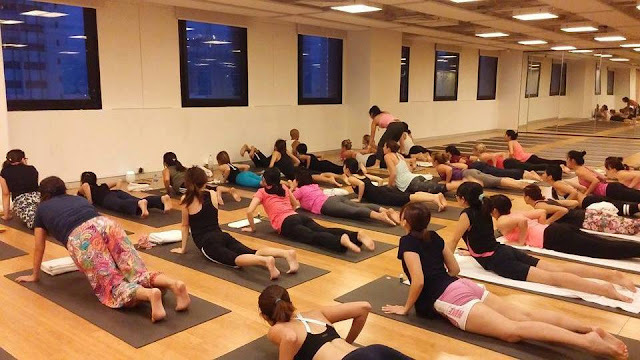 A few weeks ago, I managed to try a rare-type yoga from Pure Yoga: the Jivamukti yoga class. Pure Yoga may be quite a challenge to find for some — since the entrance requires the patron to enter through Takashimaya Tower A. When I first entered, I was surprised at the number of people that were practising Yoga on a weekday night! The counter on the left was busy attending to customers. I was attracted to the yoga apparel on the right... it looks really comfortable! It was my first time to PureYoga... but unfortunately the staff was too busy to usher us to the shelves area. I thought it was really cool that they had a locker using passcode —even Amore don't have hahah. Well it's not good for users like me who forget the passcode AND the locker number a minute later (too many things on my mind). I had to call the customer service anyway! Prepping before the session with Hazel! We started with a whiff of this pure essential oil — and it made me INSTANTLY alert. I could feel my brain cells being activated! I had a lovely time at #BLOGMEETSG with Pure Yoga. Some poses were pretty challenging, but I felt so relaxed and happy that day! I also learned that Young & Living Pure essential oil works wonders — the oils are pressed from real, fresh leaves and flowers so there is no consistency in their batches, and it is sold out pretty quickly.